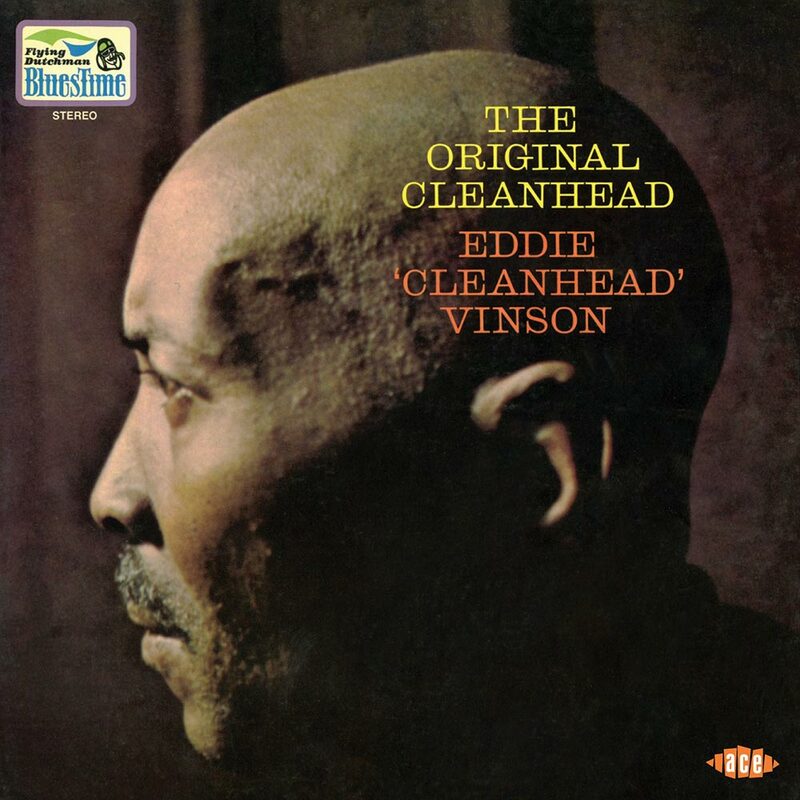 EDDIE “CLEANHEAD” VINSON-THE ORIGINAL CLEANHEAD. By 1970, Eddie “Cleanhead” Vinson was fifty-three. He was a musical veteran. His career was about to enter its fifth decade. Eddie had caught a break. Bob Thiele asked him to sign to his Blues Time imprint. It was a subsidiary of Flying Dutchman Productions. In 1970, Eddie released his what was seen as his comeback album, The Original Cleanhead, which was recently rereleased on CD by Ace Records. 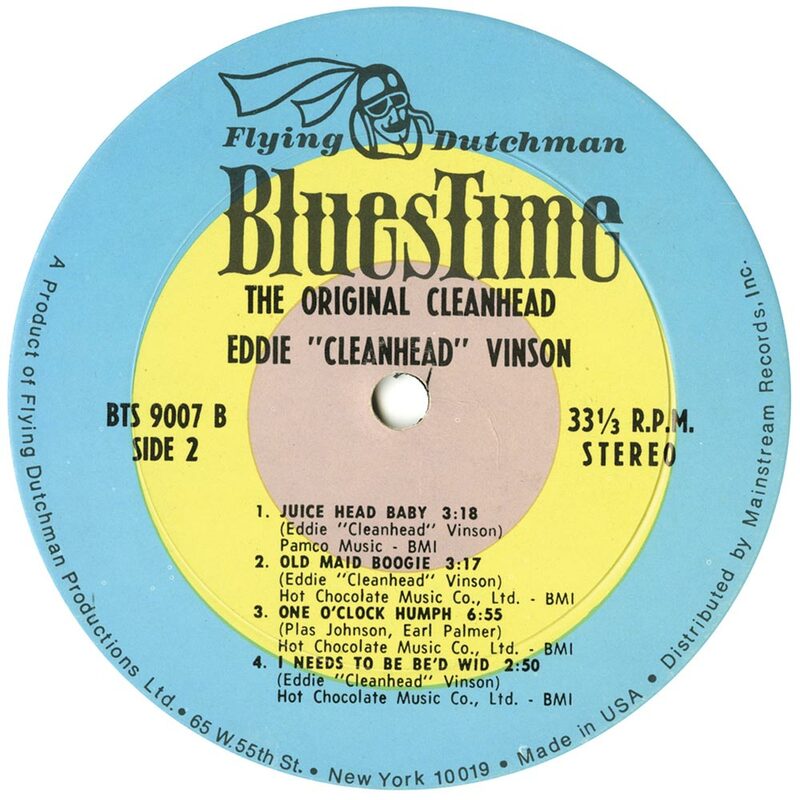 The Original Cleanhead marked a change in fortune for Eddie “Cleanhead” Vinson. After a few years in the doldrums, Eddie’s career was on the up again. This was just the latest chapter in the Eddie “Cleanhead” Vinson story. Eddie “Cleanhead” Vinson born in Houston, Texas on 19th December 1917. His family were all musical. His father played the honky tonk piano and his grandmother was a violinist. They encouraged Eddie musically. Growing up, Eddie decided he wanted to play alto saxophone. So, his father bought him a saxophone and paid for music lessons. This paid off. By the time Eddie was in high school, he was playing in Chester Boone’s band. Not long after that, Eddie turned professional and joined Chester Boone’s band full-time. This was the start of Eddie’s musical journey. Some time later, Chester Boone decided to head to New York. Chester’s band was taken over by Mlt Larkin. For Eddie this was a blessing in disguise. Milt Larkin’s band had a secret weapon. That was the horn section. It featured Arnett Cobb, Tom Archia, Illinois Jacquet and Eddie. Before long, Mlt Larkin’s band were taking on all-comers and leaving them in their wake. Duke Ellington and Earl Hines’ bands lost out, when they took on Milt Larkin’s band. This was in part down to the horn section. As a result, Mlt Larkin’s band establishing a reputation as one of the finest bands of the swing era. They were booked to play far and wide. No longer were Milt Larkin’s band playing just in their own area. They toured America. Sometimes, they toured with blues legend Big Bill Broonzy. For Eddie, this was a musical education. It expanded his knowledge of the blues. On these tours, Eddie took centre-stage during ballads. However, it wasn’t this that lead to him being spotted by Cootie Williams. Eddie was singing the blues during some downtime. Cootie Williams, who was there trying to persuade Arnett Cobb to join his band, heard Eddie singing. Eddie was asked to join the Cootie Williams Orchestra. Eddie was with the Cootie Williams Orchestra 1942 to 1945. During that period, they recorded such tunes as Cherry Red and Is Your Or Is You Ain’t My Baby. However, by 1945 was ready to form his own band. He formed his own band in 1945. Right up until the late forties, Eddie was a huge star. Eddie was one of the biggest names in blues music. His solo career got off to the perfect start. He signed to Mercury and released Old Maid Boogie. It reached number one. This was helped by Eddie moving from jump blues to a tougher R&B sound. Right through to the late forties and into the early fifties, Eddie could do no wrong. Then his career stalled. What people forget was that Eddie had been around when bebop was born. played his part in the new genre’s rise. Sadly, many people had short memories. At least Julian “Cannonball” Adderley knew Eddie still had plenty to offer. So, Julian “Cannonball” Adderley and Eddie “Cleanhead” Vinson entered the studio. The result was a collaboration between the pair, Cleanhead and Cannonball. It was released in 1961, the same year Eddie released Backdoor Blues, which featured Cannonball” Adderley. This undoubtedly gave Eddie’s career a boost. After Backdoor Blues, Eddie released Cherry Red on Blues Way in 1967. It was the blues imprint of ABC Records and had been founded by Bob Thiele. Their paths would cross again. Before that, Eddie released Wee Baby Blues on Black and Blue, in 1969, The same year, Eddie released Kidney Stew Is Fine on Delmark Records. Sadly, by then, Eddie’s career was stalling. It needed someone who could rejuvenate Eddie’s career. Who better than Bob Thiele? He’d just signed to Bob Thiele’s Blues Time imprint. It was a subsidiary of Flying Dutchman Productions. In 1970, Eddie released his what was seen as his comeback album, The Original Cleanhead. When Bob Thiele founded his Blues Time imprint, he started signing artists he’d worked with at Blues Way, the ABC subsidiary. Among them were Joe Turner and T-Bone Walker. So, when Eddie walked in the door, it was like a reunion. Having said their hellos, Eddie got down to business and began work on his comeback album The Original Cleanhead. ForThe Original Cleanhead, Eddie returned to his number one single Old Maid Boogie. He’d written the song himself. He also penned I Needs To Be Be’d Wid. Eddie and Louis Zito cowrote Alimony Blues, Juice Head Baby. Jessie Mae Robinson and Eddie wrote Cleanhead Blues and Charles Taylor and Eddie penned Cleanhead Is Back. Other tracks included Joe Pass’ Pass Out and Plas Johnson and Earl Palmer’s One O’Clock Humph. These tracks became Eddie’s comeback album The Original Cleanhead. When recording of The Original Cleanhead began, Bob Thiele had put together a talented band. The rhythm section included drummer Earl Palmer, bassist Arthur Wright and guitarists Joe Pass and David Cohen. Artie Butler played piano and organ and Plas Johnson played tenor saxophone. Eddie played alto saxophone and took charge of vocals. Once The Original Cleanhead was finished, it was released in 1970. On the release of The Original Cleanhead, the album was well received. It also had the desired effect and rejuvenated Eddie’s career. Bob Thiele who produced The Original Cleanhead, had helped get Eddie’s career back on track. The next few years would see a change in Eddie’s fortunes. This started with The Original Cleanhead, which I’ll tell you about. Cleanhead Blues opens The Original Cleanhead. It was originally recorded in 1946. Stabs of braying saxophone and pounding drums set the scene for Eddie’s vocal. It’s unmistakable. Once heard, you never forget Eddie “Cleanhead” Vinson. Here, Eddie veers between weary and sassy. Crystalline guitars, piano and the rhythm section accompany Eddie. The bass helps drive the arrangement along. Guitars are panned left and right. Meanwhile Eddie delivers a vocal powerhouse. He’s in his element. Especially as the track heads to its dramatic ending. Riffing bluesy guitar, blazing horns and pounding piano accompany him as the track reaches a crescendo. Eddie drops the tempo on Pass Out. It has a jazzy sound. Eddie blows his alto saxophone tenderly. The rest of his band play in a similarity understated way. A jazz-tinged guitar, piano and a bass which drives the arrangement along accompany Eddie. Drums mark time and never overpower the rest of the band. When the solos come round, a chiming guitar solo sets the bar. After that, the baton passes to the tenor saxophone. Next up it’s the jazzy piano. Then it’s Eddie turn. Just like the rest of the band, his playing is understated and results in a beautiful, jazz-tinged track. Cleanhead Is Back is the followup to Alimony Blues. A territorial Eddie decides to makes a return. His partner doesn’t sound too happy. Eddie is oblivious. Against a slow, broody, bluesy backdrop, Eddie becomes the seducer in chief. Searing, crystalline, guitars, stabs of riffing bluesy horns and washes of Hammond organ accompany the rhythm section. They provide the heartbeat, as Eddie sings “I’m so sorry baby, I didn’t mean to stay away so long,” during this blues’ soap opera. A searing, soaring guitar line open Juice Head Baby. It lasts forty-five seconds. The bass matches it every step of the way. Meanwhile, drums mark time, horns rasp and then a Hammond organ enters. All this is setting scene for Eddie gravely vocal. It’s a mixture of power and despair. His despair is caused by his “Juice Head Baby…she drinks whisky like water, and gin like lemonade.” No matter what he does, he can’t help “she’s got the juice head blues.” Behind him. Eddie’s band provide a moody, dramatic backdrop for his despairing vocal. Old Maid Boogie was the song that gave Eddie his only number one single. The arrangement is driven along by horns and the rhythm section. Before long, Eddie jumps onboard and delivers a sassy, swaggering vocal. Bursts of horns, washes of Hammond organ and crystalline guitar join in the fun. Then when Eddie’s vocal drops out, he’s not afraid to let his band shine. When he makes his return, it’s as if he’s been inspired, and delivers a barnstorming vocal. He then joins the rest of his band in driving the track to a blues crescendo. As the guitar and bass wander along, bursts of blues horns punctuate the arrangement to One O’Clock Humph. Gradually, the rest of the band make their entrance. The piano, drums and hissing hi-hats join forces with the rest of the band. At the heart of the arrangement is the bass. It sets the tempo and provides the heartbeat. Especially when the solos come around. They reinforce what a tight talented band Eddie has. The guitar, piano and horns play play starring roles during this laid-back fusion of blues and jazz. Closing The Original Cleanhead is I Needs To Be Be’d Wid. It was written especially for The Original Cleanhead and suits Eddie’s vocal perfectly. His band drop the tempo and provide a slow, moody and bluesy backdrop. The rhythm section and Hammond organ accompany Eddie’s vocal. It’s needy and full of emotion. Sometimes, it’s tinged with sadness and longing. Regardless of which, Eddie breathes life and meaning into the lyrics. Listening back to The Original Cleanhead, it’s no surprise that the album rejuvenated Eddie “Cleanhead” Vinson’s career. From the opening bars of Cleanhead Blues, right through to the closing notes of I Needs To Be Be’d Wid, the music oozes quality. Eddie was into his fifth decade of a musician and singer. He put all his experience to good use on The Original Cleanhead. So, it’s no surprise that The Original Cleanhead was a commercial success. It rejuvenated Eddie’s career. Ironically, when other blues musicians were reinventing themselves, Eddie kept on what he’d been doing since the thirties. Eddie wasn’t for changing. Even if he’d wanted to. That wouldn’t be easy. After all, Eddie was known for his mixture of jump blues, swing and bebop. That was what people knew Eddie for. So, with some judicious choice of material, old and new, Bob Thiele set about attempting to rejuvenate Eddie’s career. This worked. After The Original Cleanhead, Eddie’s career enjoyed something of an Indian Summer. He continued to record until his death in 1988. Eddie’s career had lasted over fifty years. 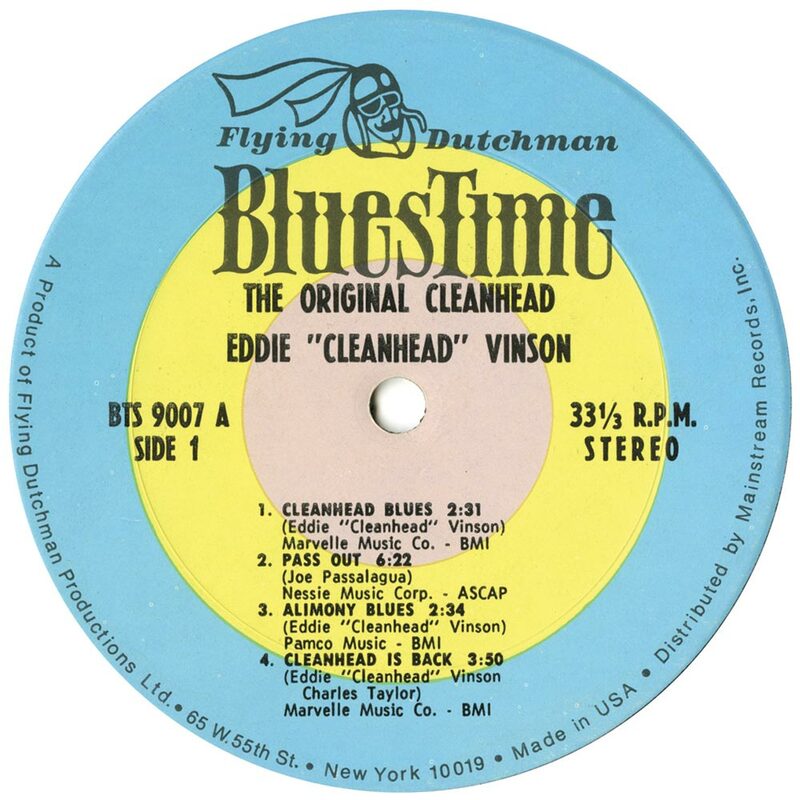 However, one of the finest albums of Eddie “Cleanhead” Vinson’s career was The Original Cleanhead, which was recently released by Ace Records. The recent release of The Original Cleanhead is a first. Never before has The Original Cleanhead been released on CD. That’s until now. As an added bonus, there are a trio of live tracks. This includes Cleanhead Blues, I Had A Dream and Person To Person. They’re a reminder of how talented and charismatic an artist Eddie “Cleanhead” Vinson was live. 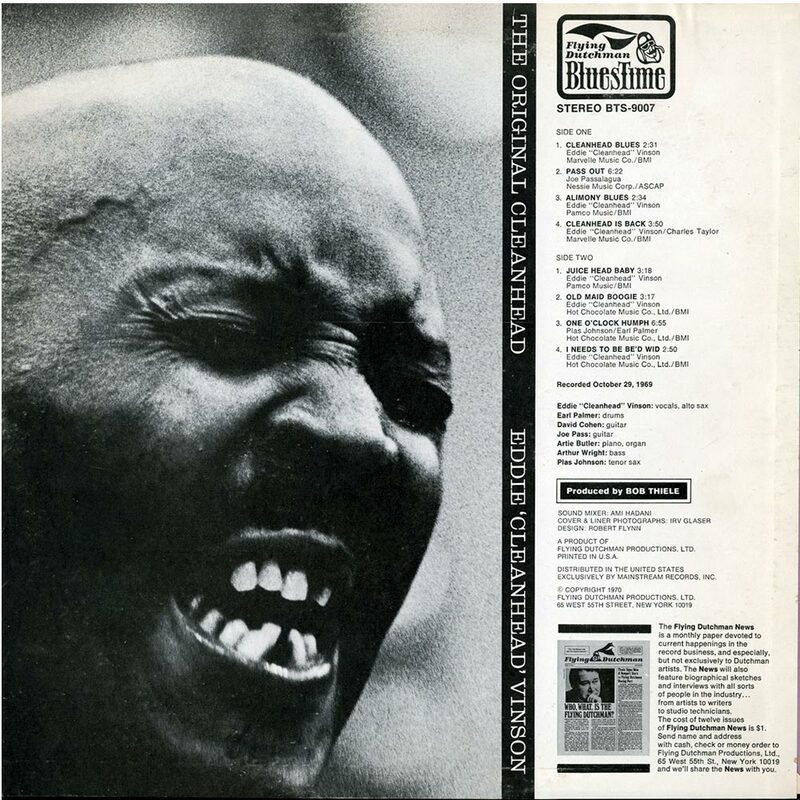 Along with the rest of The Original Cleanhead, this is the perfect introduction to the unmistakable sound of the one and only, Eddie “Cleanhead” Vinson. ← NANA LOVE-DISCO DOCUMENTARY FULL OF FUNK.